The re-designed models of the rapidcount Series from ratiotec are ideally suited as banknote counting machines for small and medium counting volumes. 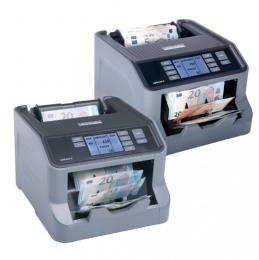 With a speed of up to 1,000 banknotes per minute, common and larger counting procedures are no problem at all. The feeder holds up to 100 banknotes, the output takes up to 200 notes. The number or value of the bills may be read easily from the integrated display. All models count and check the input banknotes in a single work step for a high degree of counterfeit detection. The test is carried out using the UV, IR and magnetic characteristics of the euro banknotes, depending on the model. The premium model of the series is the S 275 counting machine. In addition to the banknote's UV-, magnetic- and format-features, this machine provides an improved Infrared-Identification due to its high-definition Multi-Infrared-Sensor strip. This comprehensive combination-check offers a reliable detection of counterfeits at the upper end of the scale. While the S 200 piece counting machine detects only pre-sorted notes, the models S 225 and S 275 also count and check unsorted notes. This saves an enormous amount of time, especially when counting large sums, because the banknotes can simply be inserted directly from the cash register into the counter. Of course, the complete S-Series features a bundle function, an addition function for counting larger amounts in individual tranches and an automatic start-stop. Despite the high power and the very high speed, all devices are rather compact, measuring approximately 30 x 27 x 20 cm. Therefore, these devices fit into any workplace. The particularly easy and intuitive operation of the devices also ensure for a high degree of user acceptance.